Get the first book in the Derelict Saga, signed, personalized however you like, and straight from the author himself. I have a limited quantity of these and once they're sold out, they're sold out until the next con I go to. So if you want one, now would be the time to get your talons on it. I have a limited quantity of these and once they’re sold out, they’re sold out until the next con I go to. So if you want one, now would be the time to get your talons on it. Fifty years ago, Mira, humanity’s last hope to find new resources, exited the solar system bound for Proxima Centauri b. Seven years into her mission, all transmissions ceased without warning. Mira and her crew were presumed lost. Humanity, unified during her construction, splintered into insurgency and rebellion. Now, an outpost orbiting Pluto has detected a distress call from an unpowered object entering Sol space: Mira has returned. When all attempts at communications fail, S&R Black, a Sol Federation Marine Corps search and rescue vessel, is dispatched from Trident Station to intercept, investigate, and tow the beleaguered Mira to Neptune. As the marines prepare for the journey, uncertainty and conspiracy fomented by Trident Station’s governing AIs, begin to take their toll. Upon reaching Mira, they discover they’ve been sent on a mission that will almost certainly end in catastrophe. 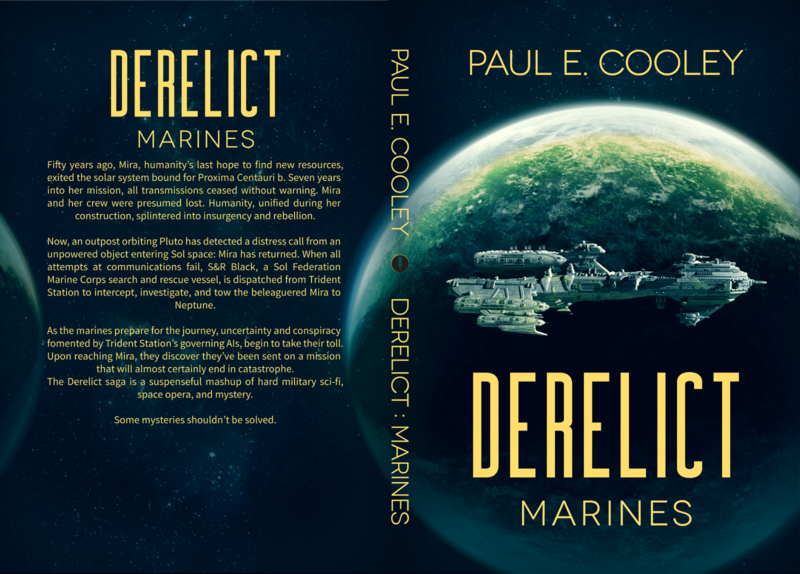 The Derelict saga is a suspenseful mashup of hard military sci-fi, space opera, and mystery. Some mysteries shouldn’t be solved.